These terms and conditions apply to the usage of the York Fine Arts website, any private sales, and all sales at York Fine Arts, either at the gallery premises or through its website. Please read them carefully, as by using this website you are agreeing to all of these Terms and Conditions. You shall be responsible for reading and understanding these Terms and Conditions, and we do not accept responsibility for any loss or damage incurred by you or any third party as a result of your failure to do so. Purchases at York Fine Arts may be made in person at the gallery, online via our website, over the telephone and by direct bank transfer. The gallery accepts cash, all major credit and debit cards, including (American Express) and personal or business cheques. Please note that when paying by cheque or transfer, any purchased items will remain at the gallery until the payment has cleared. All prices are shown in British Pounds Sterling unless selected otherwise. When selecting to view prices in a different currency, prices are converted using the rates of the European Central Bank and are automatically updated daily at 9:00am. Unless otherwise specified or agreed upon, all purchases at York Fine Arts are final. Any refunds are issued by way of exchange or gallery credit note, and are negotiated on a case-by-case basis. All online orders are deemed to be offers until confirmed either verbally or in writing by York Fine Arts. If for any reason the selected artwork is unavailable or incorrectly priced, York Fine Arts reserves the right to cancel the sale. Any deposits or set-aside payments made to York Fine Arts are non-refundable. York Fine Arts offers both international and domestic shipping, fully insured and competitively priced through UPS. Shipping costs are calculated using the weight of the artwork and the destination address. To receive an estimate for shipping, please either do so online through our shopping basket or by telephoning the gallery. Please also refer to our Delivery and Shipping page. We inspect all artworks before packaging and/or shipping to ensure the highest possible standards. But in the rare event you receive the incorrect artwork(s) or have received artwork(s) that are damaged in any way, please contact us within 48 hours of delivery to arrange a solution. Unless specified beforehand, any refunds will be issued by way of exchange or gallery credit note. York Fine Arts offers a Private Sales service, whereby privately owned paintings may be listed for sale. York Fine Arts assumes no responsibility for the provenance, condition of the artwork or any other information provided by the private seller. Private Sellers must provide all information to be included with their featured art and take full responsibility for its accuracy. York Fine Arts can supply a valuation and suggested sale price upon request and at an additional charge. Private sales listings will become live after York Fine Arts receives full payment from the private seller, and he/she has confirmed that all information for featured artwork is correct. York Fine Arts cannot guarantee the sale of any featured art. A private seller holds full responsibility for their featured art including: transactions, postage, packing and any viewing of the art. York Fine Arts cannot be held responsible for any disputes, damage or loss arising between customer and private seller during or after the buying process. Any artwork listed by a private seller is clearly marked on the website. By subscribing to our free, monthly newsletter, you consent to receive this, and any other occasional correspondence from York Fine Arts. To unsubscribe, simply reply to the newsletter with ‘Remove’ in the subject line. Reproduction of colour online is as accurate as photographic and electronic processes will allow. York Fine Arts does not touch up or alter any images apart from a tight “cropping” process to transfer the image from wall to screen. 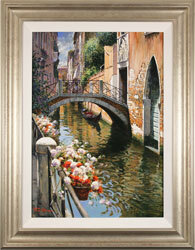 On our website, some frames may occasionally appear to be slightly bowed or bent. This is due to the transfer of the images from wall to screen, and is in no way a reflection of the actual condition of the piece. The images and designs used on York Fine Arts website are the property of York Fine Arts or their respective copyright owners. All content included on this site, such as text, graphics, logos, button icons, images, and any website code, is the property of York Fine Arts and/or its Suppliers and partners. All of which is protected under International copyright laws. The compilation (meaning the collection, arrangement, and assembly) of all content on this site is the exclusive property of York Fine Arts and protected by International copyright laws. As a user of the website you acknowledge that all copyright, trademarks and other intellectual property rights in and relating to York Fine Arts are vested in York Fine Arts or our partners where appropriate. You must not use, reproduce, modify or distribute our images or any part of those images in any manner, whatsoever. All prices and information shown on the York Fine Arts website are accurate to the best of our knowledge; however, price and availability information are subject to change without notice. If an error is discovered at any point in the sale, York Fine Arts reserves the right to the cancel or amend the sale. York Fine Arts reserves the right to change the terms of this agreement when it is deemed necessary and post a new version on our website. The new version will take effect from the day of posting on the site. If you have any questions or comments or are unhappy with any aspect of our service; visit York Fine Arts; telephone us on 01904 634221; or email info@yorkfinearts.co.uk. All correspondence is treated as confidential.